Growing up in the Detroit area, and the fact that Tim and I both spent many years of our professional working lives working for companies related to the automotive industry and suppliers, means that we love visiting classic car collections and museums as we travel throughout the Midwest. We hear a lot about the old abandoned Packard plant in Detroit, but did you know that Ohio has not one, but two different museums dedicated to the classic Packard cars in production during earliest years of the 1900s through the late 1950s? 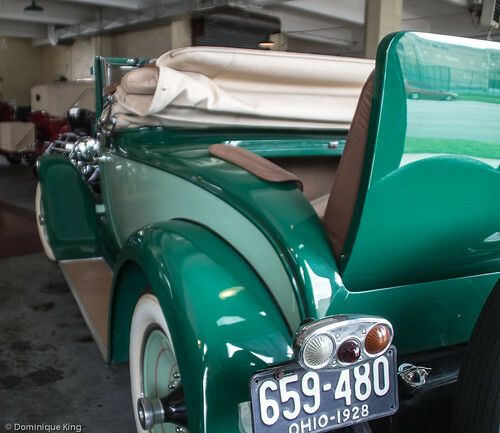 We visited America's Packard Museum in Dayton last spring and visited the National Packard Museum in Warren, Ohio just a few weeks ago. Check out the story of those two museum visits in my latest post for the Ohio Tourism Division's blog. Want to learn more about these classic cars and their Ohio background? Check out Packard Motor Car Company by Evan P. Ide or Packard: A History of the Motor Car and the Company by Beverly Kimes. Check out Detroit's Spectacular Ruin: The Packard Plant by Theresa Welsh to find out about the company's plant and history in Detroit...where the building still stands (sort of), although the future of the building remains shrouded in doubt. You can also check out the story I did about America's Packard Museum in Dayton at Midwest Guest last spring. We recently visited the Wright-Dunbar Visitor Center at the Dayton Aviation National Historic Park, and while there was lots of information about Dayton's high-flying Wright brothers Wilber and Orville, we were really taken by learning the lesser-known story of Dayton writer Paul Laurence Dunbar and his friendship with the brothers after he met Orville Wright when both were students at the city's Central High School during the 1890s. Dunbar, the son of former slaves, attended the school and graduated as a member of the class of 1891 (Orville dropped out of school to pursue his work as an inventor and engineer working with his brother Wilbur to develop a practical heavier-than-air flying machine during the earliest years of the twentieth century). Dunbar struggled after high school graduation to find a job as an elevator operator and to get his work published. The Wright brothers, who owned a print shop at the time, were among the first to publish his work. The brothers went on to achieve world-wide fame and acclaim, and Dunbar, got a lucky break when one of his former teachers invited him to speak at a writers' convention. The reading led to Dunbar's establishing a career as an author and public speaker. His rise to fame was quick, but didn't last long as he died of tuberculosis by 1906. Dunbar's legacy continued to live on as he greatly influenced African-American writers in literature and poetry during the Harlem Renaissance of the 1920s. Check out my latest post for the Ohio Tourism Division's travel blog, Explore Dayton's Aviation History to learn more about the Wrights and their friend Dunbar. Want to learn more about the Wright brothers? Check out The Wright Brothers by David McCullough. 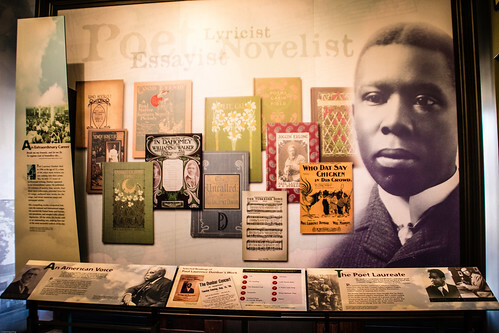 Check out Jump Back Honey: The Poems of Paul Laurence Dunbar (Jump at the Sun) or Lyrics of Sunshine and Shadow (New York-1907) to see samples of Dunbar's work. Ohio might not immediately pop into mind when people think of National Park sites, but the state is home to the Cuyahoga Valley National Park between Akron and Cleveland, as well as several other National Park Service sites like presidential homes, sites related to the War of 1812 and the National Aviation Heritage area that includes the Dayton Aviation National Historical Park, which I'll write about in future posts for the Discover Ohio tourism blog and Midwest Guest. Check out my latest post for the Ohio Tourism Division's Discover Ohio blog, which is an overview of Ohio's NPS sites and a kickoff for this centennial year for the NPS. Want to learn more? Check out First Ladies take the spotlight in Canton, a story about an NPS site I did for the Discover Ohio blog a couple of years ago or stories I did about Ohio NPS sites for Midwest Guest that include President Garfield's Lawnfield home drew the nation to Mentor, Ohio, Perry's Victory and International Peace Memorial: Bird's-eye battle view and History and nature trace a path through Cuyahoga Valley National Park. You can always check on Amazon to pre-order the newly revised and updated Cuyahoga Valley National Park Handbook by Carolyn V. Platt, which is due for a March, 2016 publish date. We recently spent a relaxing couple of days at the Inn at Honey Run in Millersburg, Ohio. Love cheese? This is the place to satisfy your cheese fix...and to pick up some of the area's popular ring-style Trail bologna while you're at it. My advice? Take a large cooler with you so you can get the goodies you'll definitely buy their home safely! If you missed my story about this cheese hunter's heaven here earlier this month, you can read my take on our cheese- and bologna-hunting adventures at the Ohio Tourism Division's travel blog. Check out Exploring Holmes Country Amish Country, my latest story for the Ohio Tourism Division's Discover Ohio website. Want to learn more about the Amish and Mennonite communities in Ohio? Check out Our People: The Amish and Mennonites of Ohio by Levi Miller, Plain Secrets: An Outsider among the Amish by Joe Mackall and Holmespun: An Intimate Portrait of an Amish and Mennonite Community by Laura Hurwitz. We recently took a trip through time to learn about Ohio's fascinating Canal Era history. 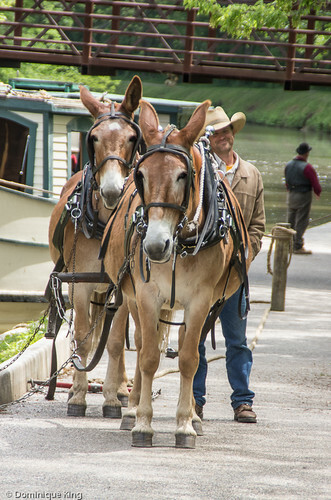 Our trip along the Miami and Erie Canal in the Providence Metropark, just 30 miles outside of Toledo Ohio, allowed us to experience a little about what it was like to travel by boats towed by mule teams. We also learned why the mule teams refused to drink the canal water when they worked the waterway during the 1800s. Yeah, the answer is a little gross, but it's amazing what you'll learn while traveling on a canal boat full of school children! Check out The Providence Canal Experience, my latest story for the Ohio Tourism Division's Discover Ohio website. Want to learn more about Ohio's canal system and its importance to the state's history and development? Check out Miami and Erie Canal (Images of America) by Bill Oeters and Nancy Gulick. Mohican and Malabar State Parks in Ohio both have interesting histories, and their relative proximity to each other make them easy to visit and explore over the course of a couple of days. I wrote about our stay at Mohican State Park Lodge and Mohican's reputation as the "Camp and Canoe Capital of Ohio" earlier this summer here at Midwest Guest. I expect to do a few more detailed stories at Midwest Guest in coming months about the history of both parks, but meanwhile, here is a quick overview of some of major attractions at both Mohican and Malabar that I did for the Ohio Tourism Division's blog. Can't wait to learn more about Malabar, the park's history as Malabar Farm and as the home of the Pulitzer-Prize winning author Louis Bromfield? Check out Louis Bromfield and His Malabar Farm by Joe James. We recently visited the small college town of Findlay in northern Ohio, and the highlights of our visit included a surprisingly diverse culinary scene and the opportunity to take a guided tour of Hancock County's beautiful late-1800s courthouse building. I've already spotlighted some of our Findlay favorites and foodie finds here at Midwest Guest, and I expect to do a more detailed article about the courthouse tour here later this autumn. Meanwhile, check out a quick overview of our visit to Findlay at the Ohio Tourism Division's Discover Ohio blog with my story, Discover Findlay, Ohio. Interested in learning still more about Findlay or vintage Ohio courthouses? 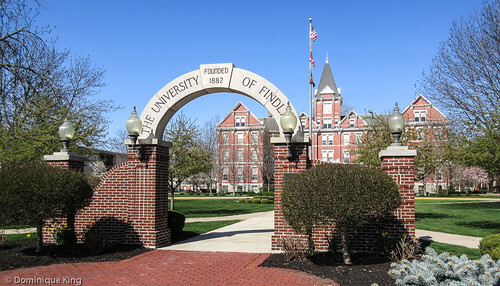 Check out Findlay in Vintage Postcards by Eric Van Renterghem or County Courthouses of Ohio by Susan W. Thrane. I also have a couple of other stories about county courthouses in Ohio here at Midwest Guest: Henry County Courthouse in Napoleon, Ohio and Defiance County Courthouse, once scheduled for demolition, stand tall in northwestern Ohio. We recently covered our visit to Ohio's Dayton Art Institute for their exhibition featuring American Impressionists here at Midwest Guest. Here is another take on our visit at the Ohio Tourism Division's Discovering Ohio blog that includes a quick history of the museum and a peek at the DAI's wonderful Leo Bistro. Come back to Midwest Guest later this year for more about our trip to Dayton, including stories about the history of the DAI, Dayton eats, Orville and Wilber Wright, Paul Laurence Dunbar and more! 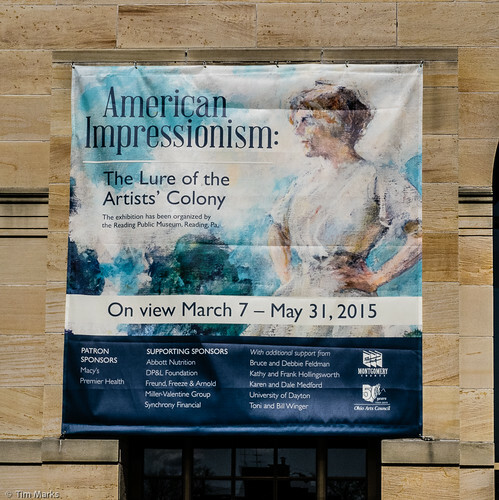 Meanwhile, there's still a just bit of time to visit Dayton and see the DAI's American Impressionism: The Lure of the Artists' Colony exhibition, which runs through May 31. Carousels aren't just kid's stuff--so I learned at the Merry-Go-Round Museum in Sandusky, Ohio. I often think of it as a the quintessential kids' carnival ride, but the carousel originally started out as a training device for knights back in medieval days and became a romantic ride for adults in Victorian days before becoming a kiddie favorite with the arrival of the 20th century. 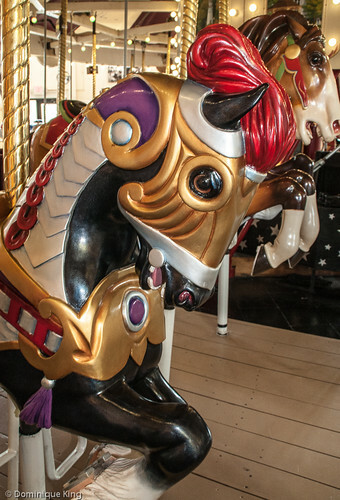 Check out what I learned about these machines and the craft of creating the beautifully carved animals that populate many classic carousels with my story about the Merry-Go-Round Museum in Sandusky at the Ohio Tourism Division's Discovering Ohio blog. Want to learn more about other classic carousels in the Midwest? Check out my stories about Ohio's Carrousel Park in Mansfield (nope, it's not a typo) with an accompanying Photo Friday feature about the Carrousel Park and my stories about the classic carousel at the Grand Rapids Public Museum in Michigan-Big -kid fun on the carousel at Grand Rapids Public Museum and another Photo Friday that accompanied that story. You can also check out Flying Horses: The Golden Age of American Carousel Art, 1870-1930 by Peter J. Malia or Carousel Animal Carving: Patterns and Techniques by Bud Ellis, Rhonda Hoeckley and Bonnie Greenwood. Sandusky, Ohio marked an important step in the journey of many enslaved people using the Underground Railroad to make their way across Lake Erie and on into Canada, and freedom, during the mid-1850s. Check out my story, National Underground Railroad Network to Freedom, about the importance of several Sandusky sites along the Freedom Trail and their recent designation as official stops along the National Park Service's National Underground Network to Freedom Trail at the Ohio Tourism's Discovering Ohio blog. Want to learn more about the Underground Railroad? Check out Gateway to Freedom: The Hidden History of the Underground Railroad by Eric Foner, which is a new book on the subject that I know is on Tim's wish list. You might also like to check out Forbidden Fruit: Love Stories from the Underground Railroad by Detroit-area journalist Betty DeRamus or Safe Houses and the Underground Railroad in East Central Ohio by Janice VanHorne-Lane.